Craig Webb is not alone! See what people are saying about George and The Mandala. Mandala started out during the summer of 1963, working as the house band at the Club Bluenote supporting visiting US R&B/Soul artists like Edwin Starr and Freddy Scott. 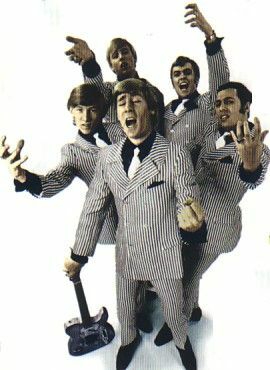 Bass player Don Elliot, drummer Whitey Glan, guitarist Mike McKenna, and keyboard/vocalist George Olliver had worked together previously in The Belltones and Whitey and The Roulettes. The quartet adopted the name The Rogues when ex-Robbie Lane and Ronnie Hawkins guitarist, Domenic Troiano, joined along with keyboardist Josef Chirowski. Original guitarist Mike McKenna had been disenchanted with The Bluenote and had quit. Olliver left keyboards and became front man for the group, which made the band a five piece unit. The group under the name The Five Rogues immediately made a visual impact with their pinstripe, gangster-style suits and their rockin' "Soul Crusade" performances. The US market soon beckoned and, after the name was changed to The Mandala, the group spent more and more time south of the border. In November 1966, the band played at Hollywood's Whiskey A-Go-Go and attracted 1,400 fans to the Hullabaloo a few weeks later, by word of mouth. The following year, the band traveled to New York on a regular basis and appeared on numerous occasions at Steve Paul's Scene. During this busy period, the group opened for hit recording artists like Wilson Pickett and The Rolling Stones in concert, and headlined in major night clubs in Canada and the U.S. This resulted in Mandala being signed to a U.S. recording deal with Chess Records on a new subsidiary of theirs - the KR record label. In 1967 they recorded their debut single, 'Opportunity/Lost Love' at Chicago's legendary Chess Studios with The Dells providing backing vocals. It stormed into the top 5 position on the Canadian charts, was voted #1 Canadian single of 1966 by the Maple Leaf Awards (pre-Juno's), and was quickly followed by another TOP 10 success with the soulful "Give & Take/From Toronto '67", released just 3 months later. During this period George and the band began work on an album but it was never finished and Mandala's personnel soon underwent changes. In 1967 George left the group in frustration and formed his first solo band George Olliver and His Children, which toured extensively in the New England area of the U.S. The new group never recorded however, and Olliver subsequently recorded an album for Firebird Records with another musical creation of his called Natural Gas in 1969. See Mandala Live Dates calendar, courtesy of Nick Warburton.